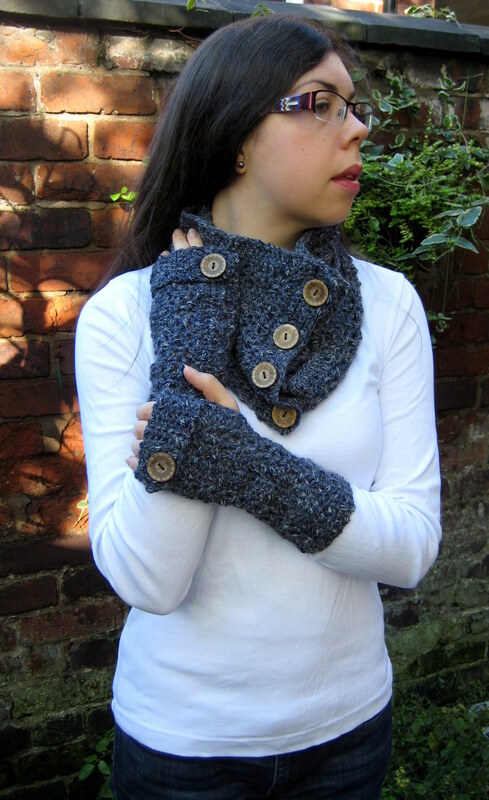 As promised, here is the matching Cowl to my Easy Textured Fingerless Gloves, which I posted last week. Once I had decided what to do with this yarn this set worked up nice and quickly, and are keeping me lovely and warm this November. I’m actually wearing them indoors to save putting on the heating too much! Do not break yarn, ch1 and turn work to sc along the short edge of the cowl to form the button placket. Depending on the size of your buttons you may wish to do more (or less) rows of sc. Fasten off the yarn and join in the corner on the opposite short edge to work the button placket with the button holes in. The instructions below make 4 buttonholes suitable for 28mm buttons, if you have more or less buttons, or smaller or larger buttons, please adjust the number of chain spaces and size of chain spaces accordingly (row 3). Fasten off and weave in ends. Sew on buttons to the button placket opposite the buttonholes. Block as desired. Thanks Carole! It’s nice to find patterns which match yarn you already have, I always think it makes the item feel like it was free! Hope you like yours as much as I like mine. Makes me feel warm just looking at it. Lovely designs. Thank you! You can make this look quite different by varying the yarn and buttons. Have fun playing around with it! I found an error in r3 when making the button holes. After the last 7sc there should be a ch 3 to make the last button hole, and then 3sc. Thank you for this pattern. I made it with a Bernat Satin and it is just beautiful. Lovely idea! What is your finished length and width? I’m thinking of trying a lighter weight yarn for spring/summer office wear. Hi Phyllis! Mine measures 24cm by 72cm. That includes the button plackets which are 4cm at either end. 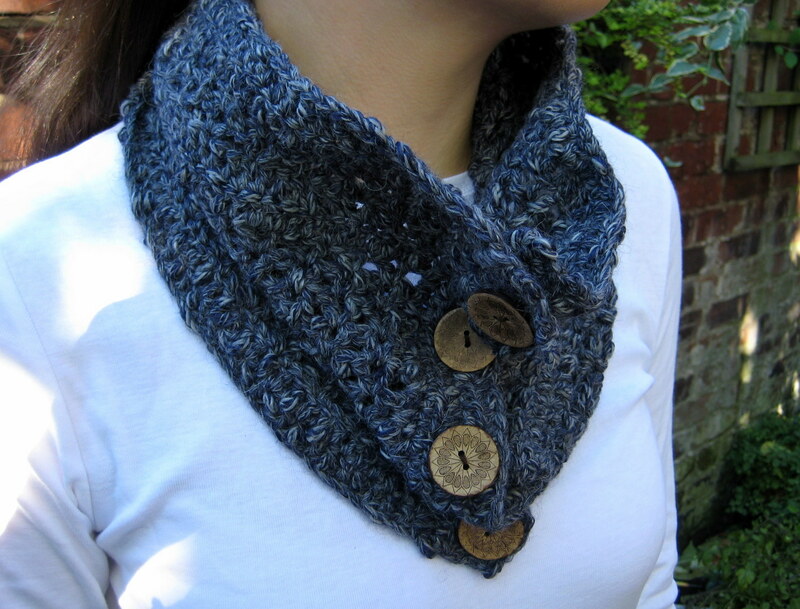 If you prefer a longer cowl just add multiples of 3 to the starting chain. Hi there! I’m not sure what you are struggling with here! There aren’t any post stitches in this pattern. Can you clarify where you are having trouble? Ok, I’m just realising what you mean- are you talking about the rows where you turn and work down the sides for the button placket? If so I just meant work single crochets over the chains (used to turn work) the same as if they are double crochets i.e. 2sc per turning chain. Hope that helps! Thanks for answering ANONYMOUS … now what about the measurements that I asked for DAYS AGO?!?!? Hi Phyllis, sorry I don’t have these measurements to hand right now. I’m on my lunch break doing my best to answer the comments I can – but it’s hard to measure something that isn’t in front of me as I’m sure you will appreciate. I’ll get back to you when I get a chance to measure it! I love this. Can’t wait to make it, and I already have the perfect yarn lying around for it. But one question. In round 3, what does sk mean? That’s what I figured. (we’ve been battling that nasty winter cough at our house for 6 weeks. I’m one tired mama right now). Oh dear that sounds like a bad bout of it! At least this project will help you wrap up warm for next time! I LOVE this pattern. 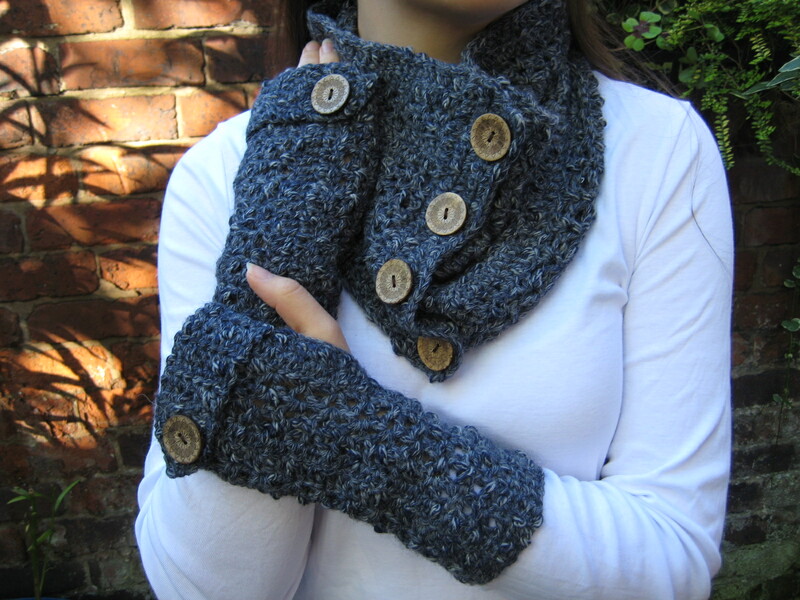 I’m wanting to do several of these for my nieces for Christmas, along with the fingerless gloves. I’m a pretty good crocheter, but I’m having some difficulty with the cowl. It says to chain 92 + 2, that would give me a total of 94 chains. I get 91 double crochets instead of 90. Then how can I get 92 doubles on the next row. I’m not counting something right, or there’s a trick that I don’t know. Please, oh please help. Ahh, I’m really sorry it’s because I either can’t count or there’s a typo! You should end up with 92sts at the end of row 1, including the turning chain as the first st. Then it’s 92 sts the whole way through until you get to the button placket. Thanks for letting me know about my error! Hi Jo! I’m glad you like this! I haven’t any plans for a matching hat but I’ll think about it! This pattern turned out great for me. I used a less chunky yarn so I could really see the patterns, and it’s quite a nice piece. You patterns are wonderfully easy to follow. I have HUGE problems with reading patterns most of the time, but yours didn’t present a single issue. Props! Hi Debbie! I picked up this yarn (SMC Aventica) from John Lewis and more recently from Laughing Hens (online). You’ll have to be fast as I think it has been discontinued! Glad you like the cowl – it seems to work well in various yarns so it may be worth a try even if you can’t pick up the same as I used!